The rectifying lens allows one to achieve a strength of 80-90% vol with a single distillation of raw alcohol.The lens is easy to use, it is easy to install on the device.The device is compact in size and does not take up much storage space. When using 2 lenses you get a double cleaning effect. 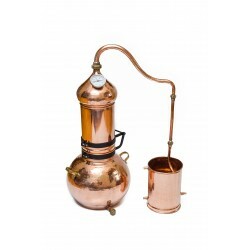 The elite distiller is made by hand by Portuguese craftsmen especially for you.This model is completely made of high-quality copper, which will allow you to get such drinks as - whiskey, cognac, calvados and chacha. 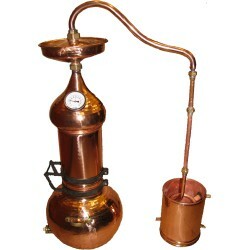 You can prepare alcohol according to the original technology, which is used by world producers of elite drinks. 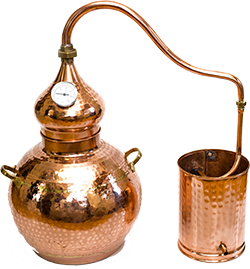 Using alambic on a water bath, it is possible to carry out distillation of any vegetable material containing fruits, berries, corn, potatoes, corn and other plant components.When distilled using a water bath, you can be sure that your braga will never burn again! 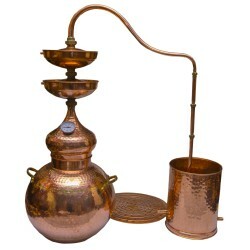 Our Alambic are made by welding, which ensures their tightness and reliability. The absence of seams inside the cube itself is very convenient and makes it easy to clean it. In the thickness of copper (1.3 mm), our alembics surpass all the alembics produced in Portugal, and they are produced only in Portugal. The coil has a large diameter, which ensures better cooling of the distillate and, ultimately, the output of a better product. 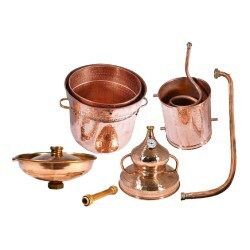 Copper is traditionally used for making dishes, since it has unique antiseptic properties and does not distort the organoleptic properties of drinks. Let us recall copper samovars, copper basins for jam, copper Turks for coffee. We have in stock most of the popular models of vehicles, we also provide prompt delivery anywhere in the European Union. Therefore, your new device will be with you as soon as possible. 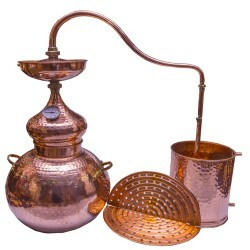 Our online store is the official supplier of Portuguese alambic. The purity of the copper used. 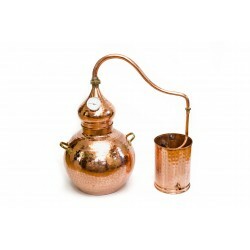 The basic factor of obtaining elite alcohol on alumbika is the quality of the copper used. This metal is resistant to the influence of fruit acids, the flavor content of the raw material will not change. Alumbic will last you a very long time, and wonderful heat-conducting qualities will allow you to fine-tune the temperature regime. 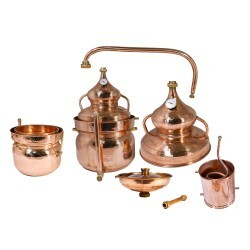 Copper absorbs sulfur and, among other things, preserves the aroma and flavor of the raw material used for brewing, which is why the product is so delicious and its aroma is difficult to compare with a conventional distillate obtained from a stainless steel apparatus. Alumbici are very simple in operation, storage and maintenance, and will suit both beginners and professionals. They can be used on any type of external heat sources - gas, electric stove, firewood.